CORNELIAN CHERRY (Cornus mas). Hedging Plants, Trees, Shrubs and Conifers. Vigorous, bushy, twiggy deciduous shrub with dark green foliage which turns red-purple in autumn. Many bunches of small mustard-yellow flowers, almost as showy as Witch-Hazel’s, on the bare stems in February make the shrub very attractive. 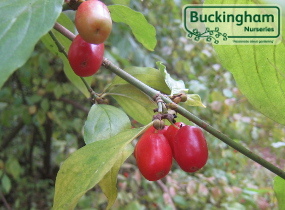 These are followed by bright red edible cherry-like fruit. Makes an excellent hedge or an unusual, attractive specimen shrub. HEDGE Trim in spring. For hedges 4-6ft (120-180cm). Plant 2-3ft (60-90cm) apart.